Are you ready for your heart to grow three sizes? 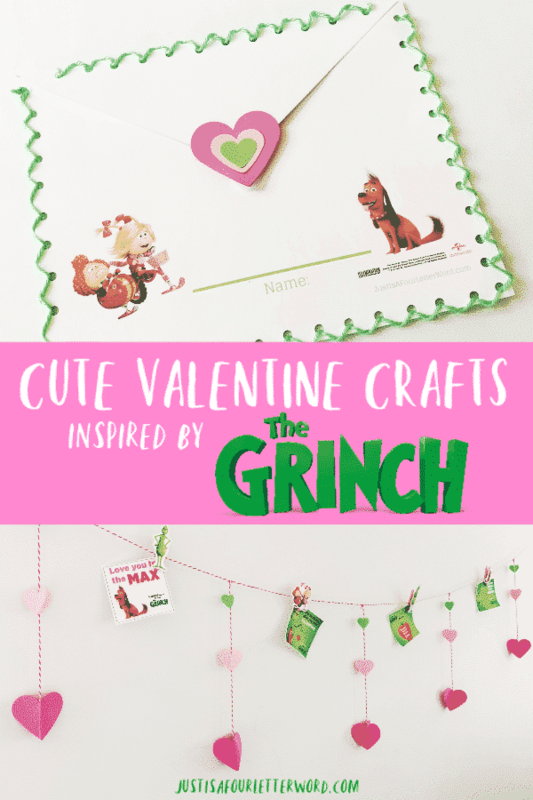 I hope so because I’ve been working behind the scenes to bring you these super cute valentine crafts inspired by The Grinch! 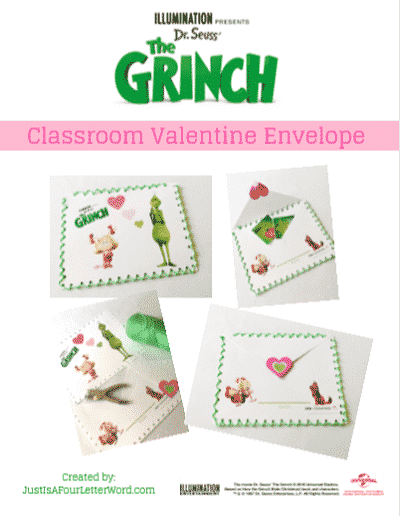 Let your heart grow three sizes just in time for Valentine’s Day with these crafts inspired The Grinch! 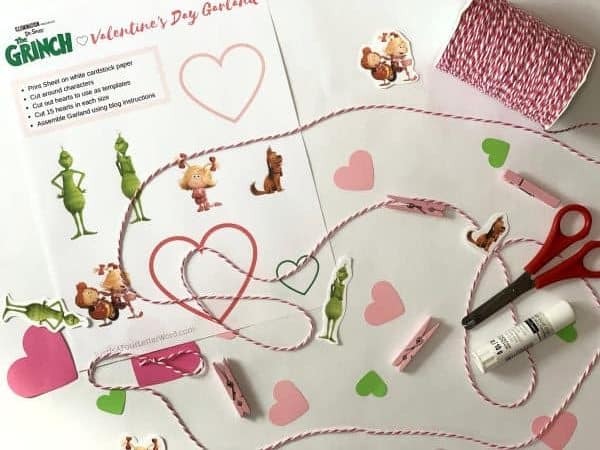 Display your valentine cards with my custom Valentine’s Day garland or create classroom valentine envelopes to fill with special notes for every kid in class. I’ve been working on these Valentine’s Day goodies for quite a while now and I’m so excited I can finally share. So grab your cardstock and get ready to print them both for free! This is a sponsored post on behalf of Universal Studios. All opinions are my own. Y’all know I get crafty around holidays. I’m not skilled enough to do anything too crazy but I love thinking of sweet valentine gifts for kids or little ways to love one another. It makes my heart happy, what can I say? 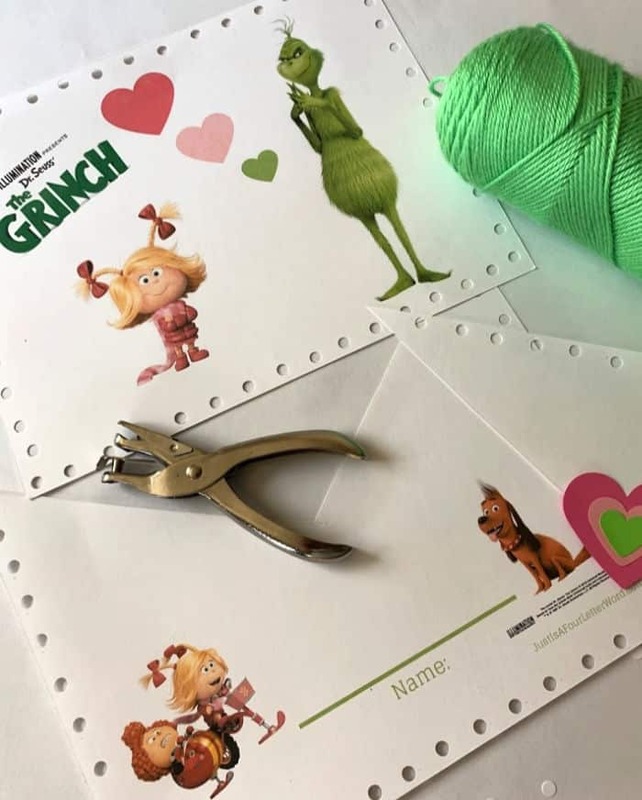 I especially love holiday garlands and with the theme of the Grinch’s heart growing three sizes in the movie, I thought this cute character garland would be perfect! 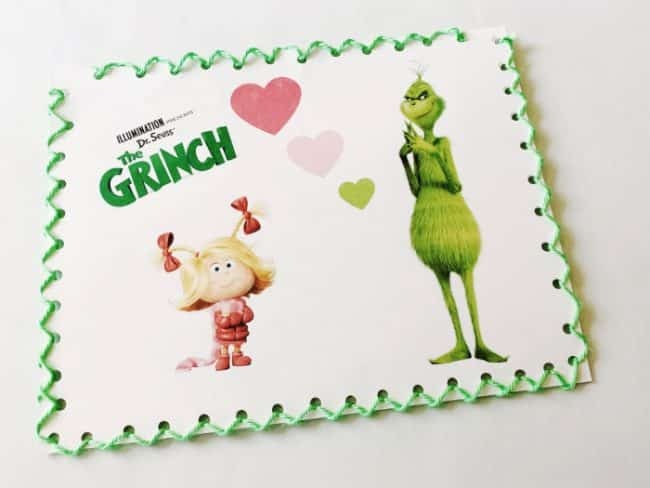 I love the way these 3D hearts dangle between card holders and create a visual of the Grinch’s heart going from small and green to full of love. 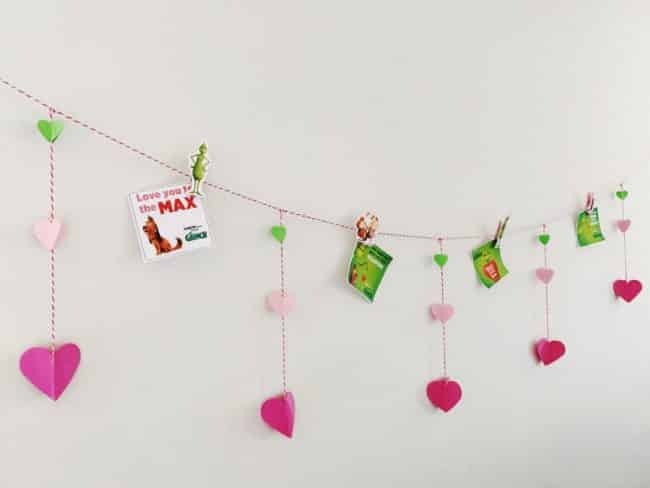 To make this valentine garland, you will need a few supplies. You can get as simple or as elaborate as you wish. 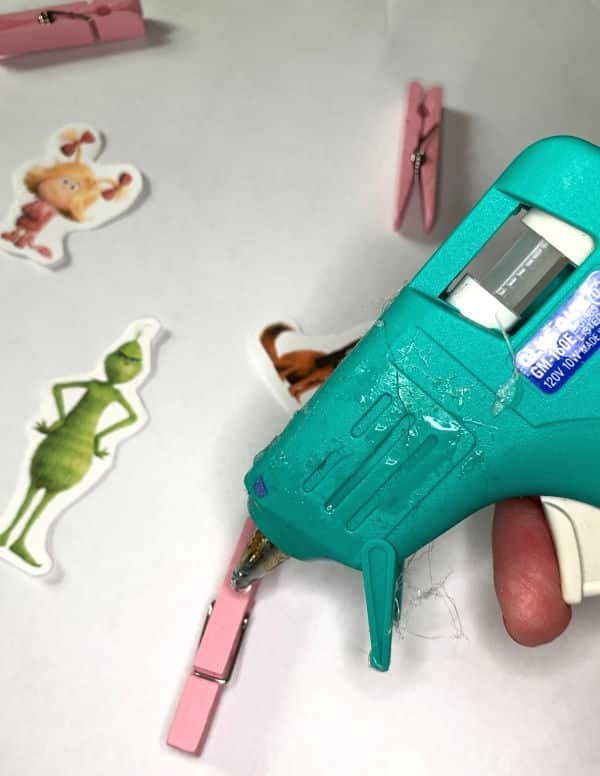 For the hearts, I decided to use heart punches because I think I will use them again and it was faster, but you can easily use scissors to cut them out while you watch…oh I don’t know, The Grinch maybe? 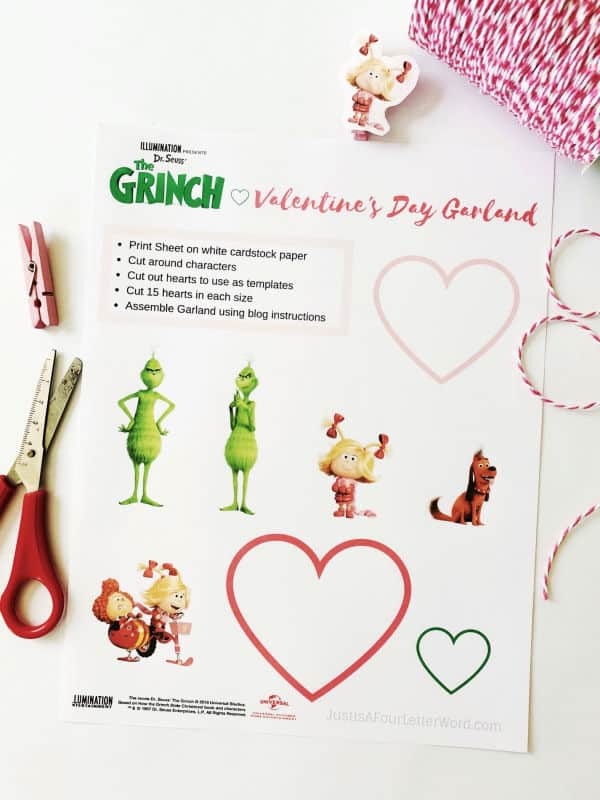 To make your own valentine garland craft, click below and use white cardstock to print the template and instructions. I’ve outlined the steps for this craft in my printable but in case you want to see how it all comes together, I decided to include them here as well. Here are the steps to make your very own valentine garland. Keep these in mind for other holidays too! This could be fun in so many different ways. 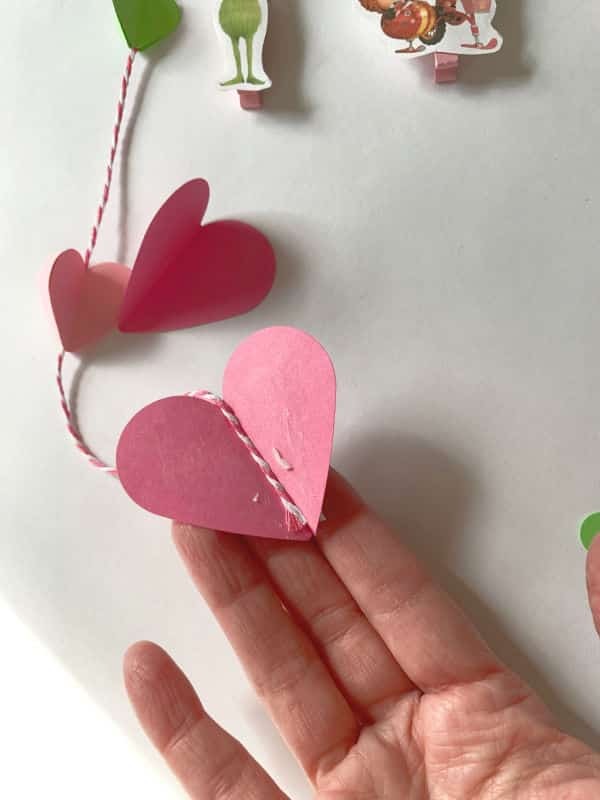 Step 3: Cut 15 hearts in each size using the templates (or punch with heart punch tools in 3 sizes) with green for the smallest heart, light pink for the medium size and bold pink for the largest. Step 4: Fold each heart in half from side to side so the point of the heart is where the crease is. Step 5: Measure the length you want for your garland and cut string. Step 8: Tie each string to main garland so they hang down. We will attach hearts to these. 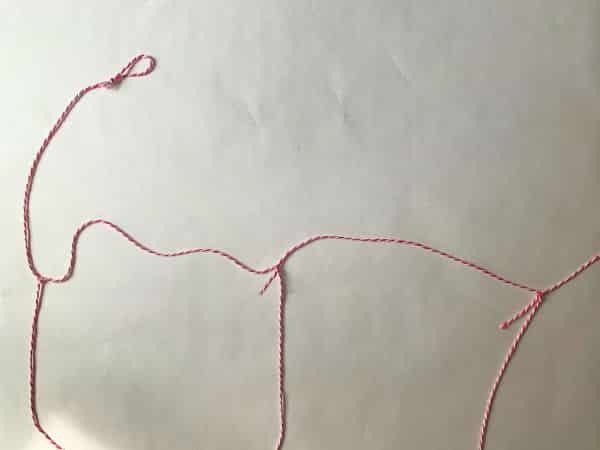 Step 10: Attach open heart to string and glue the last sides together with the the smallest heart at the top, then medium, then large. Repeat for the rest. 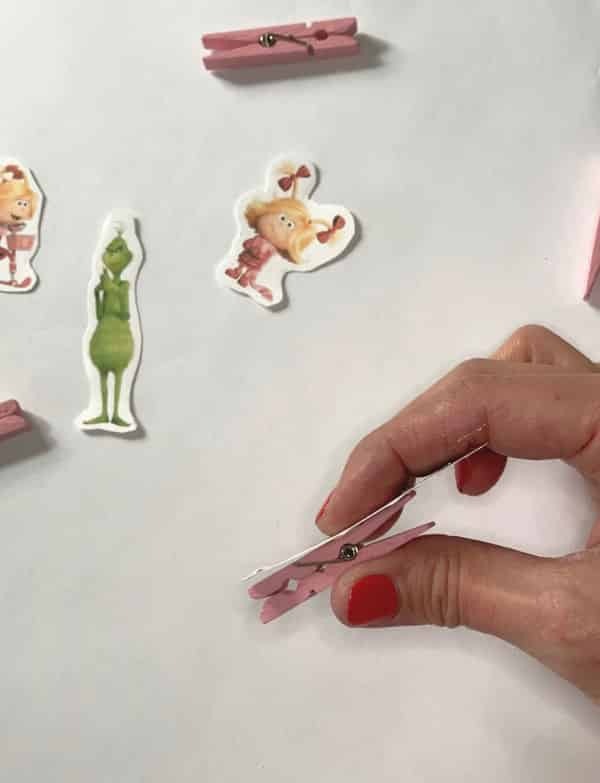 Step 11: Use Hot glue to attach characters to clothespins and add between dangling hearts. For the class valentine envelope, you could go a couple of ways. My instructions are for hand-stitching with yarn. This would be a great school project for kids to work on a little bit each day or to do at home. If you don’t have time for stitching, no worries! 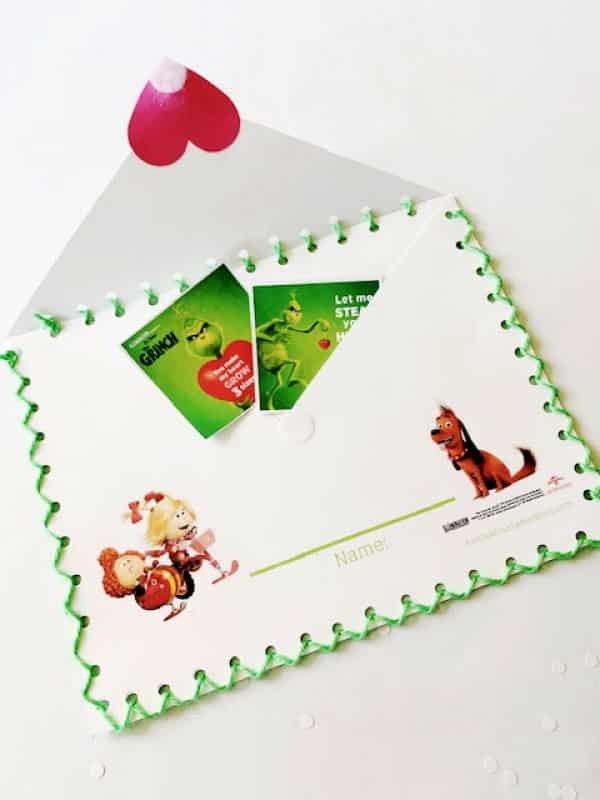 You can make this cute valentine envelope using tape instead. Easy peasy! Step 1: To create your own valentine envelope, print out the pdf above on white cardstock. Step 8: Attach heart to envelope and add velcro or tape to seal. 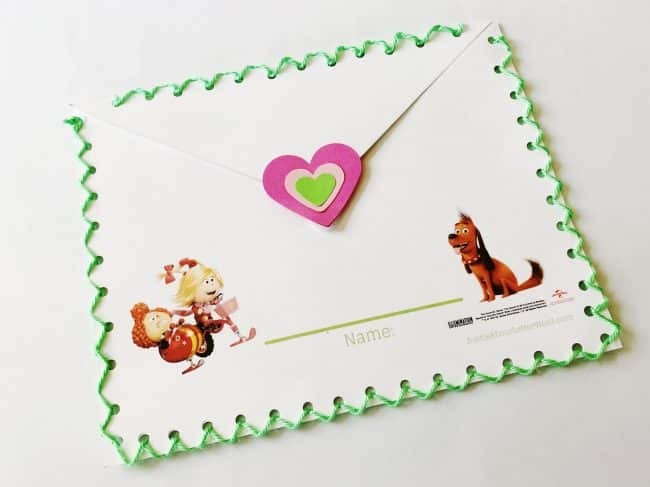 Children can add their names to the envelope and let me tell you, my kids still love getting valentines! As a mom, I’m always here with another I love you, so why not make it cute? Want to make sure teachers feel the love? Check out our list of awesome teacher valentine gifts. 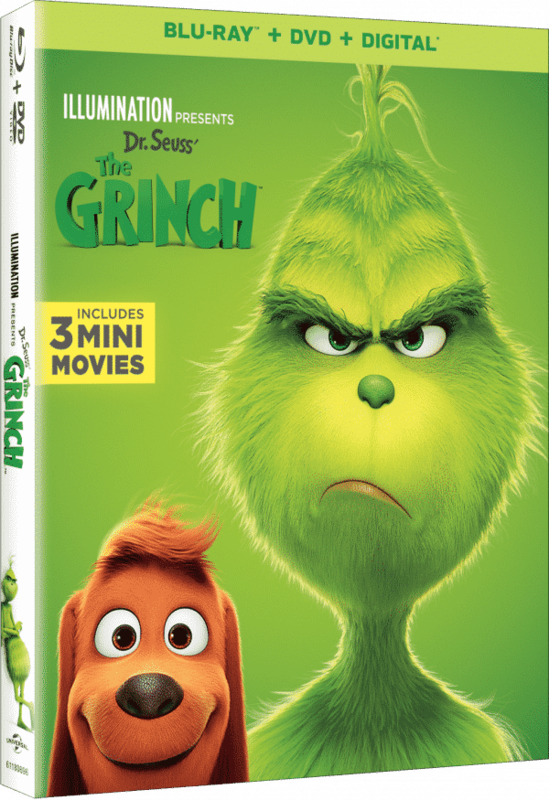 Synopsis: Illumination and Universal Pictures present The Grinch, based on Dr. Seuss’ beloved classic. The Grinch tells the story of a cynical grump who goes on a mission to steal Christmas, only to have his heart changed by a young girl’s generous spirit. Funny, heartwarming and visually stunning, The Grinch is fun for the whole family! Wishing you the best Valentine’s Day ever! Have fun! Homemade Donuts for Valentine’s Day!